I was getting tensed as I waited for the clock to hit 5pm. It was exactly 5pm as I rushed out of office and ran to the parking. Started from there around 1710hrs - and took the Abbigere-Gangamma Circle-Ramiah-Mekhri-Cubbon route to reach Shantinagar. I was on fire till I passed Mekhri Circle. Then slowed down a bit and got very relaxed as I passed Cubbon park. I reached Shantinagar TTMC at around 1815hrs. Parked my car at the bus station, and headed to A2B Restaurant next doors for my dinner. The restaurant was lousy as ever - slow service that disappoints anyone. The take ages to get the bill, or even get a product that is ready. I took a good 45 minutes to have my food. I started from there at around 1915hrs - took a BMTC Volvo to Madiwala. I got off at St. Johns Hospital bus stop, and walked towards Friends Travels. On my way met some of my acquaintances and spent some time talking to them. I headed off to Friends Travels at around 2030hrs. They issued me the ticket - the fare was Rs. 750. 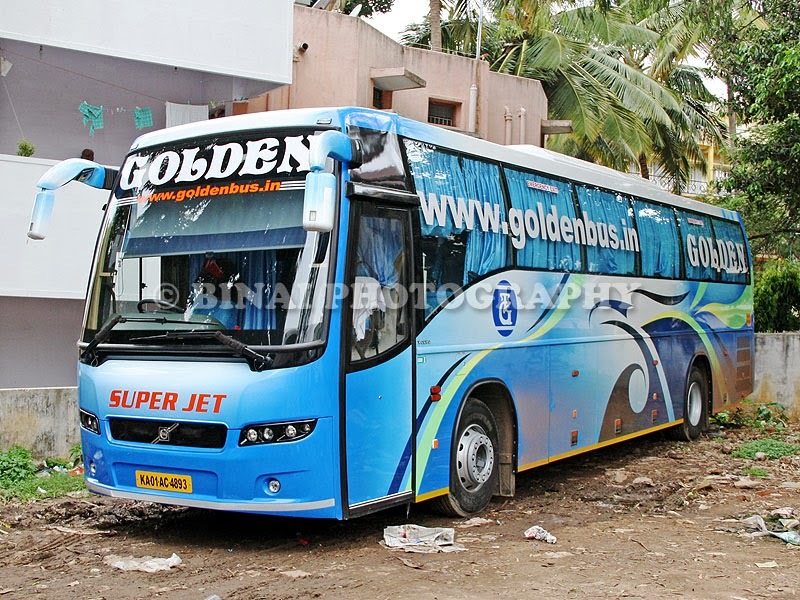 The fares of Malabar buses are controlled by the Bangalore-Malabar operators association. 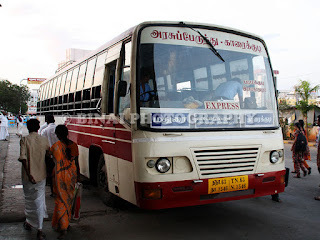 The bus was already parked at the erstwhile petrol pump - passengers were already boarding. The crew were standing outside the bus. Both the Ashoka and the Golden Volvos were parked next to each other. Golden leaves first, followed by Ashoka. There was no sign of the bus moving even after 2045hrs (the scheduled departure time). Around 2050hrs, a guy from Friends travels came in and ensured that their tickets were on board, and signaled the driver to start. The bus finally left at 2108hrs. The bus had some 15 passengers on board as we started. An FM station as played on the entertainment system. Passengers were picked up from a few more agencies en-route. Traffic was quite light for a Saturday evening. We finally pulled into Kalasipalya at 2134hrs. The bus filled up here - a lot of passengers got in, and the dickey was loaded with parcels. Tickets were checked here and boarding passes were issued. Then a headcount was taken and finally dispatched. We started off at 2159hrs. They played a movie as the bus started off. It was a Tamil movie. I watched the movie for some time. I tried sleeping, but the noise was overpowering. I was forced to watch the movie now - but now lots of snores starting accompanying the gaudy background score of the movie. In the meanwhile, the bus stopped somewhere short of Mysore on the roadside - Some people used this as a leak break. Around 0015, we passed Mysore and got into the outer ring road. The movie got over around 0045hrs - thankfully. I could now sleep for some time. I just about caught up with some sleep as the bus pulled aside once again - the lights came on, and the attendant shouted out a break. It was 0120, and we were at Cafe County, just short of Hunsur. This is one good place on the route - its been taken over by a famous restaurant group from Kannur. The place is a bit upmarket but clean and has good restrooms. It was cold outside - I did not take anything, but remained outside the bus till we were about to leave. 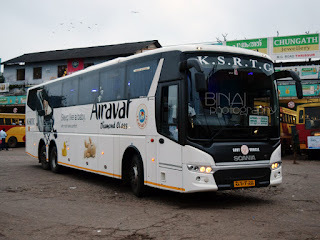 Just as we were about to leave, the Ashoka Volvo from Kannur came in. We started off at 0152hrs. A few minutes after we started off, we crossed our pairing bus. I slept off soon after we started off. It was one continuous, undisturbed sleep then. 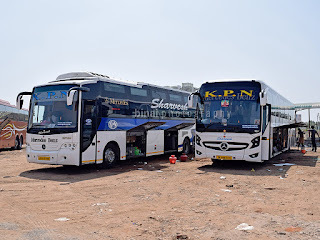 I did not notice which route we took - but I guess we might have taken the route via Periyapatna-Siddhapura, since I did not feel any rough patches. I woke up as my co-passenger shouted on his phone that the bus has reached Melechovva. OMG! We are in Kannur already! I reset by seat, and got set to alight. In the meantime, the bus rolled into Caltex Jn, and my co-passenger got off. By now, I got off the seat and moved towards the front. Informed the crew that I wanted to get off at the new Bus station. He stopped on the road that leads to the new bus station and told me which way to go. I got off the bus at 0538hrs - 8h30m from Madiwala to Kannur (7h39m from Kalasipalya). I was quite thrilled to have reached earlier than my expectation of 6AM. End remarks.. The bus, KA-01-AC-4893, had about 96,000 kms on the odo. It was maintained in stock condition - no rattles, odd noises or scratches. Driving was quite sleep friendly - absolutely no honking, hard breaking or rash maneuvers. The sole negative point was playing a movie upto 0045 in the night, and then a break immediately after that spoiling all chances of a good sleep. Its a short trip, and they could've avoided playing a movie. The interiors were ultra-clean. Golden provides blankets now. Charging Point: Available, but did not use. Will I take this service again? Sure. I will prefer this one if traveling to/from Kannur again.